$1000 per-person deposit required. Once our tour becomes 'guaranteed,' we will request an additional pre-payment of $1000 per person. Contrary to our usual terms and conditions governing deposits, once the tour is guaranteed and further pre-payment is made, all monies become 100% non-refundable, non-transferrable. Optional Single Supplement: $1534 USD (number of singles limited). This tour may require a mandatory single supplement charge of $766 if you join our share program and we are unable to pair you. This unique San Marino, Liechtenstein, Monaco, Andorra, Luxembourg & Vatican City tour gives an incredible overview of some of the hidden gems of Europe. Join us as we explore the unique culture, history and scenery of these fascinating corners of Europe. These less sizable nations tend to remain under the radar, but each one boasts a distinct culture and myriad attractions and sights. Most are so small that it is hard to even find them on a map, and few travellers know much about what they have to offer. We will examine the history, culture, and inner workings of these smallest independent countries in Europe. These are among the oldest states on the continent and, despite their diversity, they have much in common. Luxembourg - a landlocked country at the crossroads of Germanic and Latin cultures, and the largest of the European microstates. 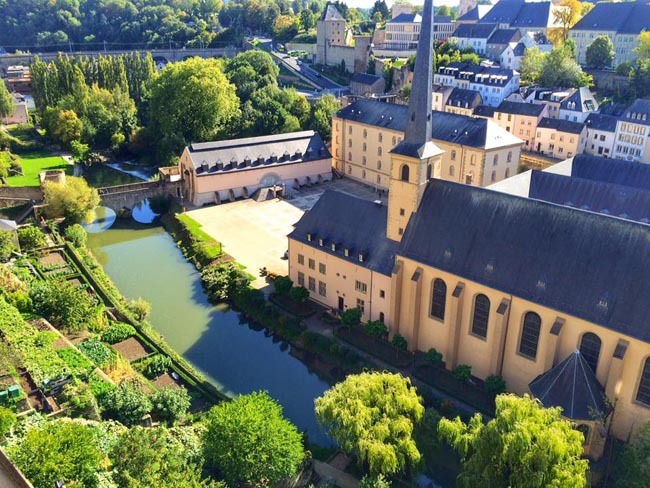 Both picturesque and romantic, Luxembourg has a wonderfully diverse topography. Lush highlands and valleys merge with steep vineyards, riverside hamlets, pastel-toned houses and medieval hilltop castles. The UNESCO listed Old Town in Luxembourg City is an unexpected gem. We will stroll through the upper and lower parts of the city, and walk along the restored Wenceslas Wall and through the valley of the River Alzette. Le Chemin de La Corniche - "Europe's most beautiful balcony" - is a pedestrian walkway built on the ramparts of the fortress-city. Andorra - a natural fortress tucked away on the south side of the Pyrenees Mountains. This principality practically dwarfs its competitors, but it's still considered to be one of the world's smallest countries. Located high in the mountains between France and Spain, Andorra consists mostly of mountainous terrain sliced by meandering rivers. The capital city is Andorra la Vella, and here we enjoy a tour of the Barri Antic (Old Quarter), one of the few parts of the capital that is still much as it was some centuries ago. Lined on either side by stone houses, the Old Quarter's streets are paved with cobblestones. Liechtenstein - a pocket-sized principality nestled in the Alps, wedged between Switzerland and Austria. Many of Liechtenstein's buildings are medieval, Gothic, and baroque in style. Republic of San Marino - the world's oldest surviving republic, surrounded on all sides by Italy. Today, San Marino is the third smallest state in Europe after Monaco and Vatican City. We explore the country's capital, with it's population of less than 5,000. This beautifully preserved medieval city is a delight with it's unsurpassed views and formidable towers. This truly is one of Europe's hidden gems and perhaps one of the most scenic of all microstates. Monaco - located along the French Riviera and bounded by France and the Mediterranean Sea. This Principality has a reputation based on wealth - making money, spending it, and living the high life. It seems almost unbelievable that a country this small could even have a border. Here we enjoy a guided tour of this City of Princes, including a visit to Casino Square and the Prince's Palace! Vatican City - may be the world's smallest independent country, but its close proximity to Rome makes it almost synonymous with the eternal city. Here we learn about the abundance of history, art and artifacts in the Vatican City which led to its designation as a UNESCO World Heritage site. This trip was like a tour through various "fairylands" with its castles, unusual locations, travel, hotels, etc. It was a wonderful trip and one that most travelers never think about, but what a way to see many unusual places of Europe. Martin (Tour Leader) is always so even in his approach to the incidents of the trip. It is his "in charge" manner that makes a trip with him make you feel totally taken care of. We thoroughly enjoyed the entire tour and all of the excursions. This was our first land-based tour with any company after many cruises, both ocean and river. We were very impressed with the experience. We will definitely travel with you again. And we loved our tour leader! Great trip! Adventures Abroad attracts nice clients and an interesting selection of tours. The tour leaders are exceptional, local guides are informative and the accommodations are well located. We had never traveled by train in Europe before this tour and were a bit nervous about the train travel on this tour. We found the trains a great experience and will have many memories of our experiences with the trains. They are more comfortable than buses. The seats are roomier, there is access to toilets and food is available on some trains. Space for our luggage was a concern at times but it always worked out okay. Our tour leader made train travel easy by always giving us the train schedule and seat assignments ahead of time. All the local guides were very good to excellent. They all spoke English very well. The guides we enjoyed the most were in San Marino, Monaco, Barcelona and Belgium. Highlights were San Marino, the city tour in Barcelona, and Brugge. The choice of local restaurants was excellent. They always had an enjoyable ambience and some unique interesting feature. Our tour leader did an excellent job making arrangements ahead of time to meet all our dietary needs. We did get to sample many of the local delicacies. 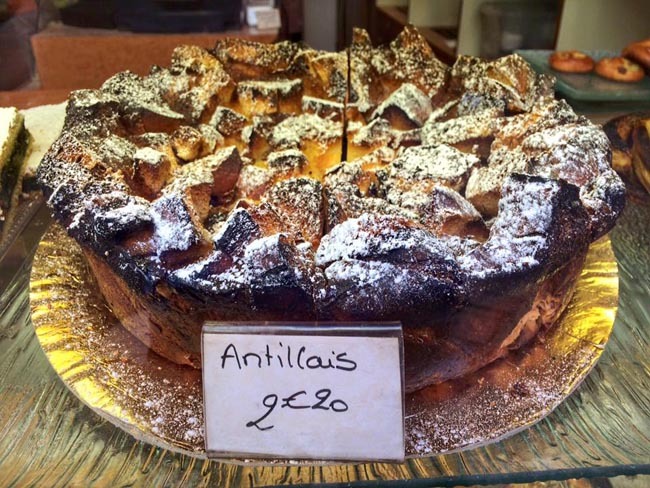 We had taken a few trips before with AA but we were intrigued by this Microstates itinerary. Hard to say which parts were most enjoyed! Had some great moments in Carcassonne, Liechtenstein and traveling thru some of the smaller places. All the local guides were so well trained and all really had vast background of information on the local sites. Food, especially when family style was served, was rather abundant. Fresh quality was noted. Our tour leader was very energetic and always went way beyond what we thought would have been an acceptable tour guide role. She just did a lot for everyone because she really wanted to make this trip a good/great trip, and she did! Was a unique and worthwhile trip. Today we arrive in Rome and transfer to our hotel. There are few cities in the world as beautiful as Rome, and few are as glamorous. With an artistic heritage dating back to Etruscan times, Rome is one of the world’s great art cities. Throughout history, it has played a starring role in the major upheavals of Western art and the results are here for us to see -- breathtaking baroque churches, stunning Renaissance frescoes and amazing classical statues. Rome is the true 'Eternal City', and it boasts one grand tourist attraction after another. For any traveller the memories of a visit to the Roman Forum and the Colosseum will last forever. This ancient city has two focal points: the Colosseum to the east, and the Campidoglio (Capitoline Hill) to the west. In between lie the Forums. 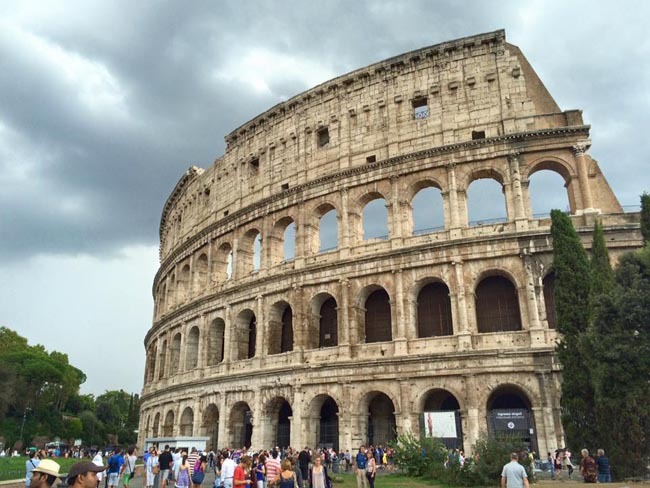 Rome is best explored on foot, and today we will experience many of the impressive sights on offer. Our grand tour will of course include a visit to the Roman Forum and the Colosseum. Though it's only a shell of its former glory, the Colosseum remains the greatest architectural heritage from ancient Rome. It was here in this massive structure, capable of holding 80,000 people, that the fabled and bloody gladiatorial combats took place. 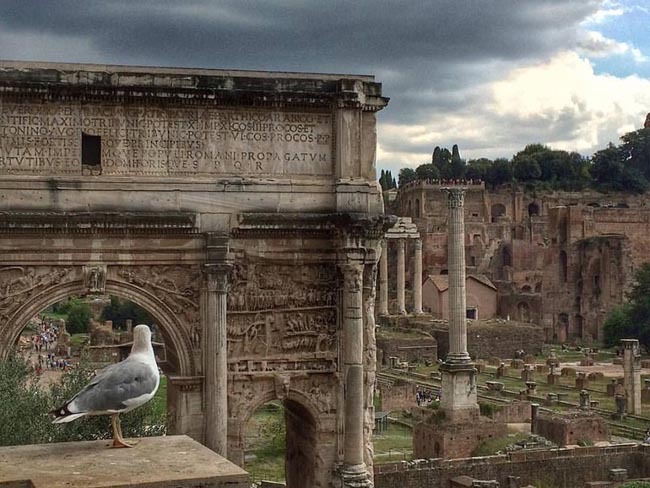 The ancient Roman Forum was the political and commercial center of Rome when Rome was at its greatest power. The Forum was constructed over some 900 years with various emperors adding and extending temples, monuments, and buildings. We will walk in the footprints of emperors here at the monumental center of life in Ancient Rome. We will see the ruins of the temples and markets that surrounded the main square, and walk along the famous Via Sacra, where the most important public and religious buildings of the city were situated. We will walk up to Campidoglio. The Capitoline Hill is the smallest and most important of the seven hills of Ancient Rome. As the political and religious heart of Rome the hill became a symbol of Rome's reign as capital of the world. We can then walk down to Piazza Venezia, the central hub of Rome. This piazza is at the foot of the Capitoline Hill and next to Trajan's Forum. The main artery, the Viale di Fori Imperiali starts here. 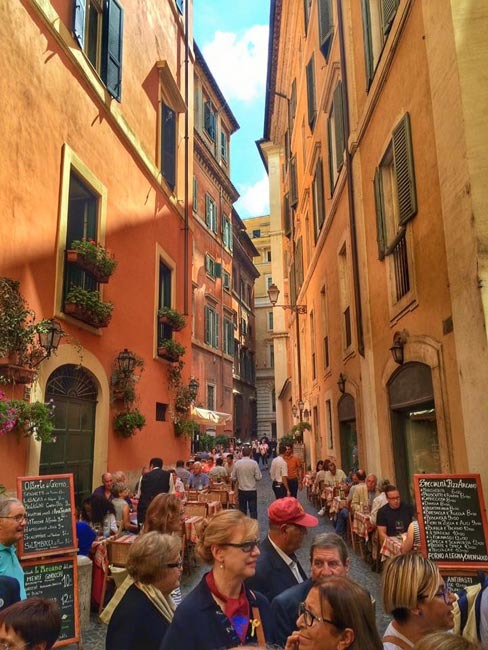 We can make a break for lunch at Piazza Navona, arguably one of the most famous and beautiful of Rome's many squares. Our next stop is the Pantheon. The Roman Pantheon is the most preserved and influential building of ancient Rome. This Roman temple was dedicated to all the gods of pagan Rome. As the brick stamps on the side of the building reveal it was built and dedicated between AD 118 and 125. The emperor Hadrian built the Pantheon to replace Augustus's friend and Commander Marcus Agrippa's Pantheon, which burnt to the ground in 80 A.D.
We will end our day with a visit to Trevi Fountain & the Spanish Steps. This fountain almost fills an entire piazza, and is one of Rome's most famous landmarks. The flamboyant baroque ensemble depicts Neptune's chariot being led by Tritons with sea horses -- representing the moods of the sea. The water comes from the aqua virgo, a 1st century BC underground aqueduct, and the name Trevi refers to the tre vie (three roads) that converge at the fountain. **Much of today's tour will occur on foot and with Rome's efficient public transit system. Technically, the tiny walled enclave of Vatican City is not a country but a 'sovereign city-state' ruled by whichever Pope is currently in office. With a mere 900 residents, this is the smallest independent state in the world, by both area and population. The Vatican City is a 'must-see' for every traveller. Today we will tour the Vatican Museums, Sistine Chapel, and St. Peters Basilica. In the museums, among the largest in the world, our guide will introduce us to masterpieces of Medieval, Renaissance and Baroque art and the sculptures of ancient Rome, helping us to make sense of the sheer volume of paintings, mosaics, statues, and artifacts in these rooms, explaining each item's place in the rich tapestry of Vatican City history. Although it's impossible to see all of the vast collection, we will witness many of the priceless treasures acquired by the church over centuries. We then continue to the awe-inspiring Sistine Chapel, which is undoubtedly the most famous chapel in the world. We will learn about the paintings of Michelangelo, and of his predecessors, who covered every inch of these walls and ceilings. You'll hear about the history of the period, with the difficulties encountered by the patron, Pope Julius II and by the artist, Michelangelo. Leaving the Sistine Chapel, we will enter St. Peters Basilica! Standing beneath Michelangelo's great dome, one cannot help but feel somewhat humbled by the expansive surroundings. The Basilica features several chapels, and contain numerous statues and mosaic works. The Pieta, one of Michelangelo's most well known religious sculptures, is among the highlights of this part of your visit. There will be some free time left this afternoon for you to explore more of the interesting market streets in this neighbourhood. This morning we depart from Rome and travel by train* to Rimini from where we drive the short distance inland to San Marino. The tiny Republic of San Marino is the oldest surviving sovereign state and constitutional republic in the world. Entirely surrounded by Italy, and just a few miles inland from the coast, one finds San Marino. Welcome to San Marino! Incredibly, this tiny state perched atop Mount Titano in the Italian Apennines has been an independent republic since 301 AD. * We use trains throughout this journey; YOU MUST BE ABLE TO MANAGE YOUR OWN BAGS ONTO/OFF TRAINS AND IN TRAIN STATIONS. Packing light is essential; there will likely be NO ONE to assist with your luggage. If you over-pack you will have a difficult time on this tour. Today we will enjoy the many charms of this tiny republic, and learn about San Marino's history while soaking in the city's unsurpassed views. San Marino claims to be the world's oldest republic, and its medieval streets, walls and towers are certainly captivating! The three towers of San Marino, named Guaita, Cesta and Montale, have become the country's most popular symbols. We can climb up to the Castello della Cesta, the highest and mightiest of San Marino's three fortresses, and delight in the incredible sweeping coastal panorama that unfolds beneath us. 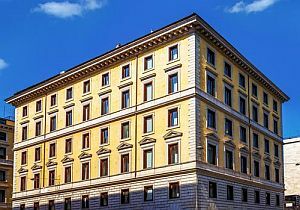 We will also visit the Palazzo Publico, with its richly decorated facade. An extraordinary panoramic view of the Apennines Mountains and Adriatic sea will be waiting for us. We will explore the town's focal point -- the main square Piazza dell Liberta with the town hall, the Basilica of the saint Patron Marino and the First tower. Dominating the historic heart of San Marino, the stone government buildings of Old Town cling to the side of a hill, which rises sharply from the surrounding plateau. San Marino's status as a republic goes back to 301 AD when the rocky land was given to the stonecutter Marinus by the local nobility as a present for his charitable acts to the community. Despite occasional army invasions led by power-hungry bishops, San Marino has largely preserved its autonomy throughout the last 1,700 years by consistently backing the winning side in the many power struggles between its warring neighbours. The foundation of Italy in 1861 formally recognised San Marino's status and ended all threats to its sovereignty. We will enter the Parliament Building and see the lavishly decorated Great and General Council Hall, the name of the debating chamber where the Captains Regent and the other 58 elected representatives meet each month. San Marino may be one of the world's smallest nations, but for those who take the time to look, it is much more than a place to add another stamp to the passport. This morning we depart from San Marino and return to Rimini where we board our first train heading in the direction of Monaco. Today is a full day of travel by train, with 1 or 2 connections along the way. Late this afternoon we will arrive in miniscule principality of Monaco -- situated by the Mediterranean Sea, resting between the French and Italian Rivera's. The surface area of Monaco is 485 acres, of which nearly 100 were recovered from the sea during the course of the last twenty years. Monaco lies on a narrow coastal strip, which in some places rises vertically upwards with its highest point at 206 feet. In Monaco one is dazzled and amazed at every turn! From the historic old town to the stately Prince's Palace and the famous Place du Casino, we will discover the rich history of the Grimaldis and the Principality. Contemporary Monaco comprises five districts: Fontveille is the newest area of the Principality, created from land reclaimed from the sea; La Condamine is the second oldest area in Moncao. This is the shopping and marketplace of Monaco, located at the foot of "the Rock"; Monaco-ville, the ancient city upon which stands the Prince's Palace, the famous Oceanographic Museum, quaint cobbled streets and the Cathedral; the hillside Moneghetti where the spectacular Exotic Gardens bloom; Monaco's beach-side playground at Larvotto, and the most famous district of all, Monte-Carlo -- the heart of the Principality and home to legendary casinos, hotels, shops and gardens! This morning we will see the best of Monaco. Our touring will include a visit to Monaco's most famous resort area, Monte Carlo. Here we will visit Casino Square and the Prince's Palace. The Princes Palace is located in a unique setting upon the "Rock" of Monaco. Built on the site of a fortress erected by the Genoese in 1215, the splendors of this Palace can be admired by all; including its Italian-style gallery, 15th century frescoes, Louis XVth lounge and the Throne Room -- decorated with an impressive Renaissance fireplace. We will see the beautiful gardens and admire the mega-yachts in the sparkling harbour. We will learn about the royal and religious history of Monaco at the Monaco Cathedral, a remarkable Roman-Byzantine church which is home to the burial places of past sovereigns, including Prince Rainier and Princess Grace. The Monte-Carlo Casino and Opera House was built in 1893 by Charles Garnier, the architect of the Paris Opera House. Its marble paved atrium, surrounded with ionic columns made of onyx, gives access to the Opera Hall, which is entirely decorated in red and gold, with bas-reliefs and sculptures. 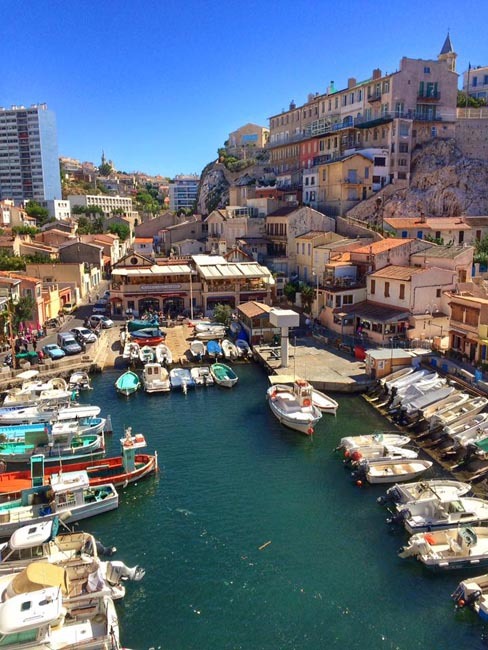 This afternoon we will enjoy a scenic drive along the Mediterranean coast to the city of Nice. On our way we will travel to the picture-postcard town of Eze. This stunning medieval village sits 1,400 feet (427 meters) above the sea and provides us with breathtaking views of the Cote d'Azur! 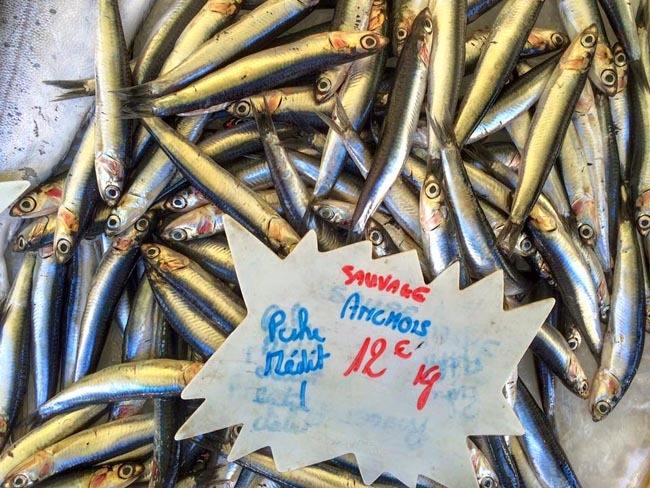 Our sightseeing in Nice will start with the busy Cours Saleya, the city's main market square since the Middle Ages. We'll then follow the narrow streets of the Italianate Old City to the spacious boulevards and promenades of the city's newer side. On our drive back to Monaco we will take the route through La Turbie, a beautiful village known as the 'Terrace of Monaco.' Here we will see the 'Trophee des Alpes', an impressive Roman monument built by Emperor Augustus, before crossing the border into Monaco. This morning we make an early departure and travel by train to Carcassonne. 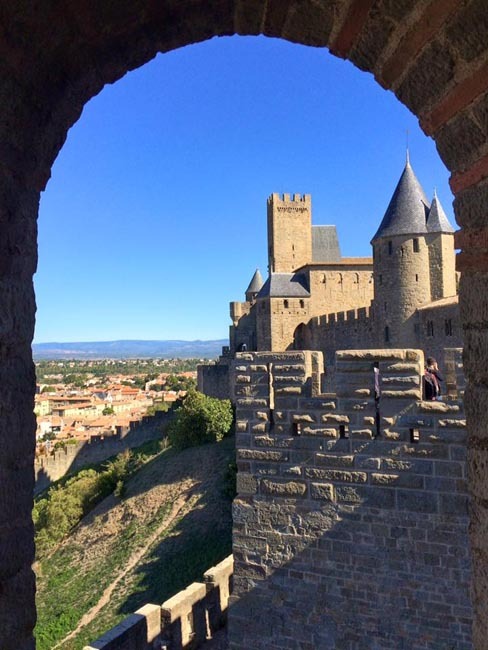 The walled city of Carcassonne in Languedoc is world renowned as a spectacular fortified medieval city. This rocky spur has been occupied since the 6th-Century BC, first as a Gallic settlement and later as a fortified Roman city. The Visigoths seized the city in the 5th-Century, and were followed by the Saracens, who remained in control for a mere 30 years before the Francs expelled them. Restored in the 19th-Century, the city fortress was classifies as a UNESCO World Heritage Site in 1997. 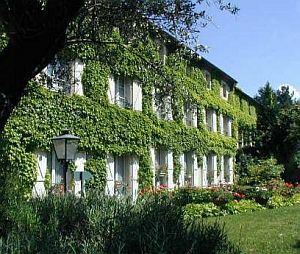 The former military enclosure of the lower town's "La Bastide Saint-Louis" is listed as a conservation area. Our morning walking tour of Carcassonne will explore the medieval architecture of the city, and will allow us to discover the rich culture that has inspired poets and writers. The city is divided into 2 parts; the town and the famous Cite de Carcassonne. We will pay more attention to the Cite, where we discover the castle and ramparts at the heart of the medieval city; explore the Cathedral and the Basilica of Saint Nazaire; and visit la porte Narbonnaise, which was the principal entrance to the Cite. 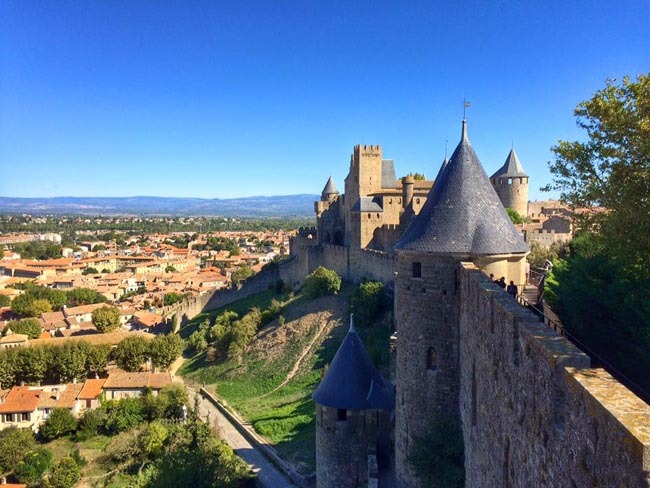 Set high up on a hill is Carcassonne's ancient walled city. This fairytale collection of drawbridges, towers and atmospheric cobbled streets is a 'must-see' destination. Its medieval core, the cite, was added to the UNESCO World Heritage list in 1997. Although both the Romans and Visigoths were here, Carcassonne really flourished in the late 12th century. In 1355 the lower town was burnt to the ground by the Black Prince, one of the key figures in the Hundred Years' War of the Middle Ages, miffed at his failure to capture the citadel. Carcassonne's key role in cross border trade with Spain, however, dried up with the signing of the Treaty of the Pyrenees in 1659, when Roussillon was restored to France. As trade dwindled, the city walls, no longer needed for protection, fell into disrepair and it wasn’t until restoration began in the 1800s that things started to improve. It was this project that helped save Carcassonne and ensure that the city of today is so outstandingly beautiful. This afternoon we will enjoy a leisurely boat tour along the UNESCO protected Canal du Midi, which flows through the city of Carcassonne. The need for a waterway, a 'Canal du Midi', to link the Atlantic with the Mediterranean was voiced by the Romans and again by Charlemagne but it took Le Roi Soleil and one of his Salt Tax Collectors to make it happen. We will spend a few hours discovering the canal's locks and bridges before returning to the hotel. This morning we drive from Carcassone to Andorra, where we arrive in time for lunch and an afternoon of touring. The Pyrenees chain of mountains forms a natural barrier between France and Spain and extend from the Bay of Biscay to the Mediterranean Sea, a distance of about 270 miles. This range covers an area of over 20,000 square miles, with an average summit height of only 3,500 ft (1067 m). Many peaks in the central range rise to over 10,000 feet above sea level, and the highest point is Pico de Aneto at 11,168 ft (3404 m.). Andorra sits high in the eastern Pyrenees, and is not only known for its mountain setting, but also its easy-going banking, duty-free shopping and low low taxes! 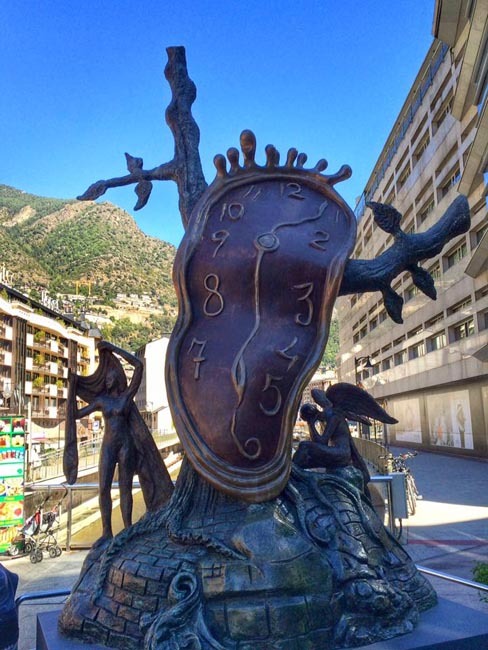 The main city in Andorra is the capital, Andorra la Vella: it's the country’s largest town, and even though much of its history has been submerged behind smart hotels and swanky department stores, there are still old cobbled streets, a 16th century parliament house, and lots of churches to be seen. Pockets of old-world charm can still be found in the old center. The Barri Antic, or 'Old Quarter' is one of the few parts of the capital that is still much as it was some centuries ago. Lined on either side by stone houses, the Old Quarter's streets are paved with cobblestones. The main building in the area is the Casa de la Vall, the National Parliament of Andorra. The Casa de la Vall has been used as a legislature since 1702; prior to that, the building was the home of a wealthy nobleman. Mentioned in documents from the 9th century, the pre-Romanesque form of the Church of Santa Coloma is one of Andorra's oldest. The church's tall, freestanding 12th-century bell still stands intact, whereas most of the remainder has been much modified over the centuries. All the church's 12th-century Romanesque murals, except one entitled Agnus Dei (Lamb of God), were taken to Berlin for conservation in the 1930s and still languish there. Today we will drive from Andorra to Barcelona, visiting the medieval Spanish village of Baga along the way. Surrounded by the rocky peaks of Cadi-Moixero National Park, we explore Baga's central square and medieval church. Baga was founded in the 9th century AD, but the town was later redesigned in the 13th century and is a rare example of medieval city planning. 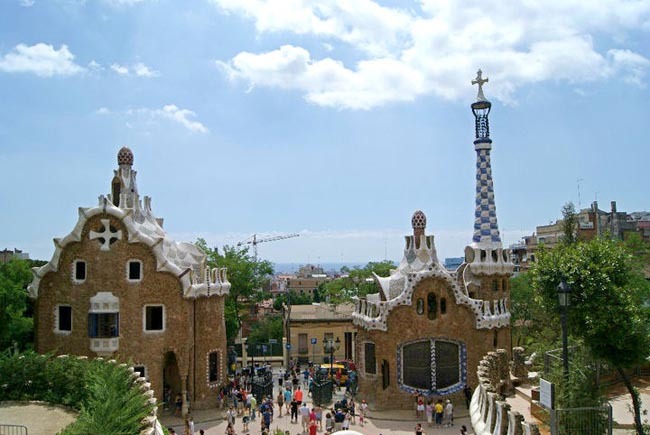 Upon arrival in Barcelona we will commence with a walking tour of the Old City. We will start at the Plaça Reial, only steps away from the busy "Las Ramblas". This square is certainly one of the most picturesque in Barcelona. Plaça del Pi is a beautiful square in the middle of the Gothic Quarter with the XIV century Santa Maria del Pi church. The old Jewish Quarter is not only the oldest part of the Gothic Quarter but also one of the most intriguing places in Barcelona. Here we walk through narrow passages and past ancient houses. Plaça Sant Jaume has been the centre of political life in the city for over 2,000 years. Today, the main government buildings dominate the square. 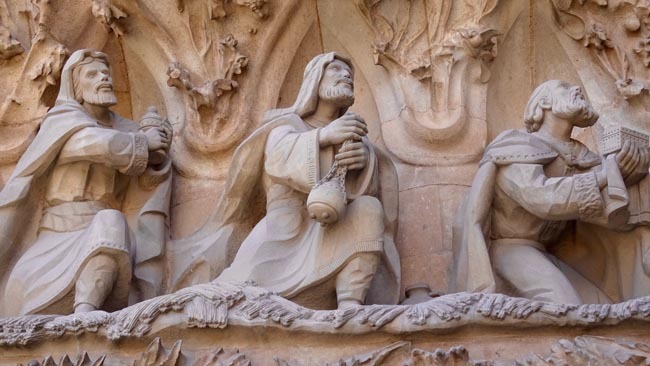 The Cathedral cloister is situated in the traditional spiritual centre of Barcelona. This is one of the most impressive cathedrals in Spain. Its XV century cloister has been called "the loveliest oasis in Barcelona". Plaça Sant Felip Neri is hard to find as it is hidden at the edge of the Jewish Quarter. 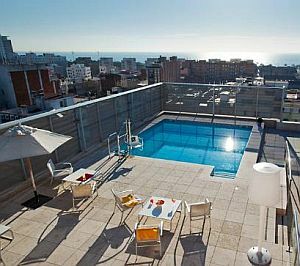 Here you will feel miles away from busy Barcelona. Roman heritage is all over Barcelona, its impressive city wall appearing in the strangest of places. But there is much more than just the wall. Stepping into the square of Placa del Rei is like travelling back through time. This morning we will continue with our sightseeing in Barcelona. We will start with a visit to Barcelona's most famous and most photographed attraction -- La Sagrada Familia Cathedral (Cathedral of the Holy Family). This amalgam of fantasy and Gothic impulses is Gaudi's most unique piece of architecture. We will explore the interior as well as the cathedral museum! We then continue to Passeig de Gracia, one of the major avenues in Barcelona. 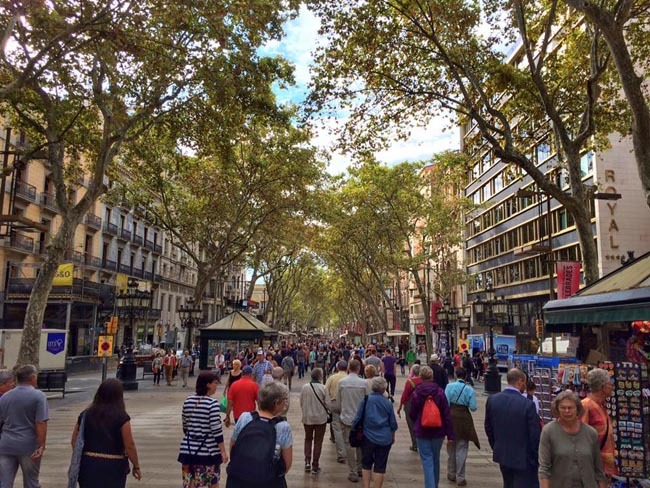 Passeig de Gracia was from the beginning designed to be Barcelona's Grand Avenue. This is Barcelona's most elegant avenue and one of the best architectural walks in the city. The quality and quantity of modernist buildings is unrivalled. It's origins can be traced back to Roman times when it was a path that linked to the Via Augusta. Nearby is Casa Batlló, built between 1904 and 1906 in the heart of the city, is the most emblematic work of the brilliant Catalan architect. Gaudí gave Casa Batlló a facade that is original, fantastical and full of imagination. 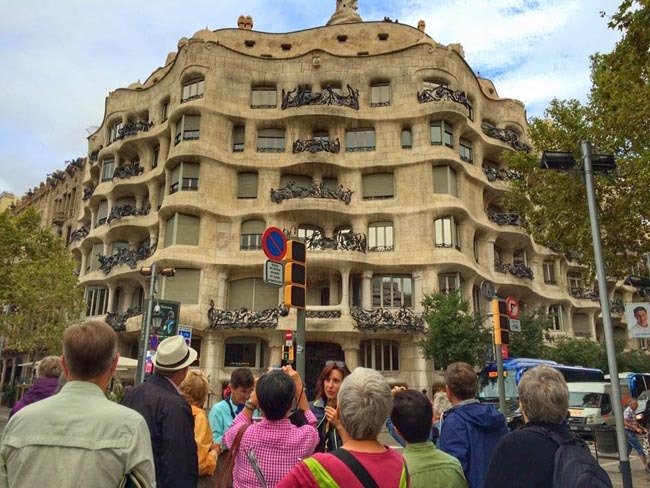 Casa Mila, popularly known as 'La Pedrera' (the stone quarry), was constructed between 1906 and 1912 by Antoni Gaudi. Due to its unique style, and artistic value, this building was inscribed on the UNESCO World Heritage List in 1984. After our half day of sightseeing the balance of your afternoon is free to explore on your own. This morning we will fly from Barcelona to Zurich (Switzerland), the gateway to Liechtenstein. Upon arrival we will travel by road to Vaduz, the capital of Liechtenstein. Along our route we visit Appenzell, Switzerland, another step into the past. Delightfully quaint, this settlement with its old-fashioned houses seems caught in something of a time warp. With about 7,000 inhabitants, Appenzell the a political, economic and cultural center of Appenzell Innerrhoden, the smallest Swiss canton. Here one finds pretty lanes, small stores and boutiques, and facades of buildings decorated with frescoes. The village of Appenzell is situated in beautiful landscape of rolling hills. In the center of Europe lies this tiny country, sandwiched between Austria and Switzerland and tucked away in the mighty Alps! Truly landlocked, Liechtenstein has no seaport or airport, and is made up of just 11 villages. The name 'Liechtenstein' was given to the region by the Princes of Liechtenstein, who in 1719 purchased the County of Vaduz and the lands of Schellenberg and united them to form the Principality of Liechtenstein. This well-ordered principality is one of only two (the other is Uzbekistan) "doubly landlocked" nations, that is, bordered entirely by other landlocked nations. For those who like immersing themselves in nature, Liechtenstein is the place! This is the only country located fully within The Alps mountain range, creating lovely landscapes and a truly mountainous terrain. This afternoon we will start our touring of Liechtenstein. Today we will learn about the constitutional hereditary monarchy, the Princely Family, the country's political and economic development and the local population. Many of Liechtenstein's buildings are medieval, gothic, and baroque pieces of architecture. The Prince of Liechtenstein lives in the Vaduz Castle (Castle Liechtenstein), a quaint little palace built upon a hilltop. Built in the early 1100's, this castle is the property of the Royal Family, and is not open for public viewing. Our walking tour in Vaduz will start next to the government building, and we will see the Vaduz parish church, the Museum of Fine Arts and the town hall. The Kunstmuseum Liechtenstein (Liechtenstein Museum of Fine Arts) is the state museum of modern and contemporary art. This collection of international modern and contemporary art is also the national art collection of the Principality of Liechtenstein. With a population of only 5000, the capital of Vaduz is really just a little larger than a village. Today we will spend some more time in Vaduz and then move away from the centre for some further exploration. The National Museum goes by the name of Landesmuseum and contains coins, weapons and traditional exhibits. Here we will se a permanent exhibition focusing on the history, culture and landscape of the Principality. To see how Vaduz once looked we will venture northeast to Mitteldorf. This and the surrounding streets form a charming quarter of traditional houses and gardens. Triesenberg is a little bit different from the rest of the country -- for one the language here is the Walser dialect. The Walsers are a people who arrived here in the 13th century from Switzerland. The lovely onion-domed church, resting on a terrace above the Triesenberg, has a vantage view of the Rhine Valley. Here we will see the Walser Museum. We will head to Feldkirch (Austria), often referred to as 'the door that opens into Austria'. Medieval in character -- Feldkirch is conveniently located on the border and is nestled in a picturesque place where three valleys meet, and includes a well preserved old town and the dominating edifice of the ancient Shattenburg Castle. At the end of our day we return to Vaduz and enjoy a guided tour and tasting at Hofkellerei, the Wine Cellars of the Prince of Liechtenstein. The Prince of Liechtenstein Winery in Vaduz is home to the Herawingert vineyards, with several hectares of south-west-facing slopes. With the mild climate influenced by the warm 'Fohn' wind, Herawingert is among the best wine-growing regions in the Rhine Valley. This morning we depart from Vaduz and drive back to Zurich where we board our train for Luxembourg. Today is a day of travel, and we will most likely arrive in Luxembourg in the late afternoon. Luxembourg is a landlocked country in the Benelux bordered by Belgium, France and Germany, lying at the crossroad of Germanic and Latin cultures. It is the only Grand Duchy in the world, and it is the second-smallest of the European Union member states. Within this country are the remnants of a rich history, and a landscape with scenery that varies from wild highlands and peaceful river valleys to plains dotted with picturesque villages and farmlands. Luxembourg owes its continued existence to a mixture of good fortune and good diplomacy, which have prevented it from being permanently absorbed into the territories of its larger neighbours despite the small nation's strategic location at the heart of Europe. Although similar in size to a typical English county, there are a number of distinct geographical regions. Most of the northern half of the country is made up of the high plateau of the Ardennes, carved and scarred by a network of steep-sided thickly forested river valleys. The southern half is gently rolling lowland, covered with woods and farmland. There are no towns of any significant size in the north. In the southeast is the rich wine-growing valley of the Moselle River, which enjoys a unique microclimate well-suited to the cultivation of grapes. The capital, Luxembourg City, is built on a rocky outcrop overlooking the two adjoining gorges of the Alzette and Petrusse valleys. Today we will tour Luxembourg and enjoy many of the sights that this country has to offer. 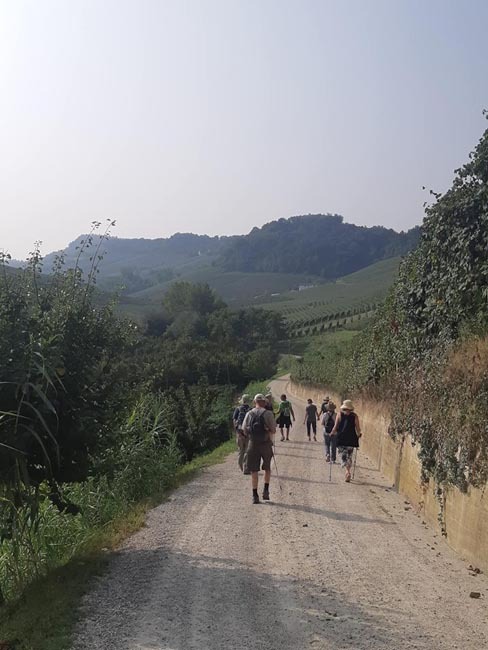 We will stroll through the upper and lower parts of the city, and walk through the valley of the River Alzette with its impressive fortifications. Le Chemin de La Corniche, nicknamed "Europe's most beautiful balcony", is a pedestrian walkway built on the ramparts along the east side of the fortress-city. Grund is a picturesque little neighborhood, situated deep down in a gorge, where some of the stone houses are built directly into the rock faces. Here we find a 15th century bridge, ancient stone fortifications, terraced gardens and vineyards. We will see the massive rock outcropping called Le Bock that forms the east side of the haute ville. First fortified during the Roman Empire, today this is a UNESCO World Heritage site. We will visit the Musee National d'Histoire et d'Art and gaze at the enormous Roman Mosaic and exhibitions, including the painting gallery. We will step inside the beautiful Cathedrale Notre-Dame de Luxembourg! We see the Palais Grand-Ducal; this recently-restored building is a 16th century structure and the city residence of the Grand Ducal family. 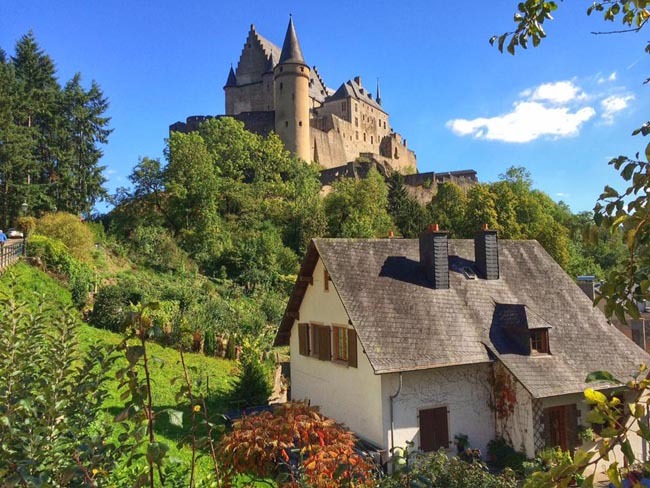 After lunch we turn north to Vianden Castle, constructed between the 11th and 14th centuries on the foundations of a Roman 'castellum' and a Carolingian refuge. It is one of the largest and most beautiful feudal residences of the Romanesque and Gothic periods. A tour through the rooms, terraces, and grounds offers not only a glimpse into a millennium's worth of history, but also provides striking views of the town and countryside. Today we travel by train from Luxembourg to Bruges. Our route takes us via the city of Brussels, where we will disembark for some lunch and some sightseeing. Being at the crossroads of cultures (the Germanic in the North and the Romance in the South) and playing an important role in Europe, Brussels fits the definition of the archetypal "melting pot", but still retains its own unique character. In Brussels we will explore the medieval city center, and our focus will be the Grand Place. This small but delicately sculpted 15th century town square was erected over centuries, and has become this modern day representation of Brussels' history. Almost all of the buildings have a historical significance and the Hotel de Ville (the Town Hall) is still used today! 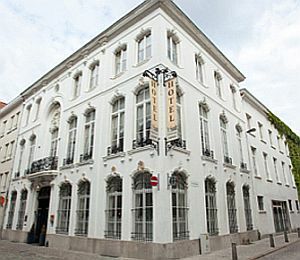 Located in Brussels city centre, just down from Brussels Centrale, this ancient market place is a great focal point. 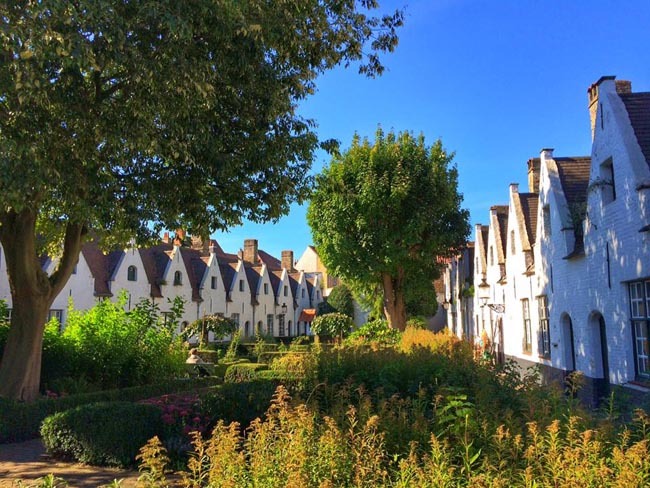 We later continue by train to Bruges, a charming warren of cobbled streets, vast churches, canals lined with gorgeous old warehouses, and a spectacularly lovely main square. Bruges, one of the best-preserved medieval cities in all of Europe, is an unforgettable experience for any traveller who walks its ancient streets. Coined the "Venice of the North" because of its beauty and many canals, Bruges is a city with 2,000 years of history and a most glorious past. 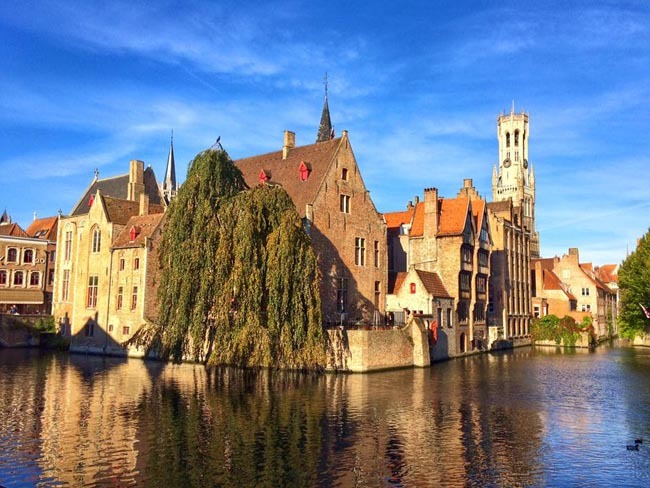 In the Middle Ages, Bruges was the most important economic center in Northern Europe. Today we will explore the city's wealth of history and culture. Here the entire historical city center is a UNESCO World Heritage Site, and meandering through its narrow cobbled streets is a joy. 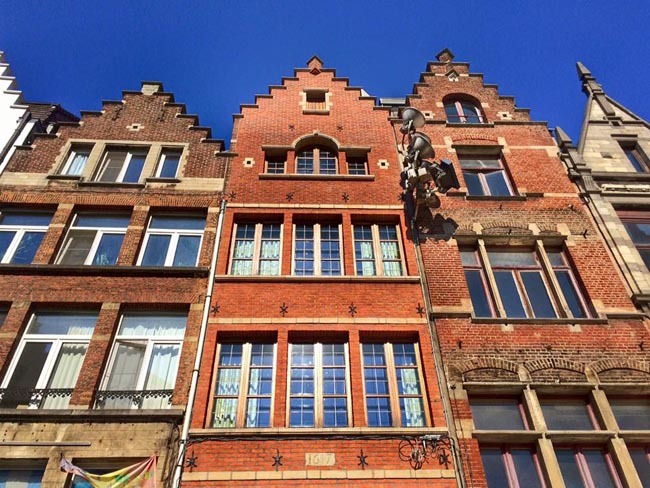 The best way to see Bruges is on foot, as almost every street is lined with historic building. So, today we will enjoy a walking tour of this 'city of canals'. 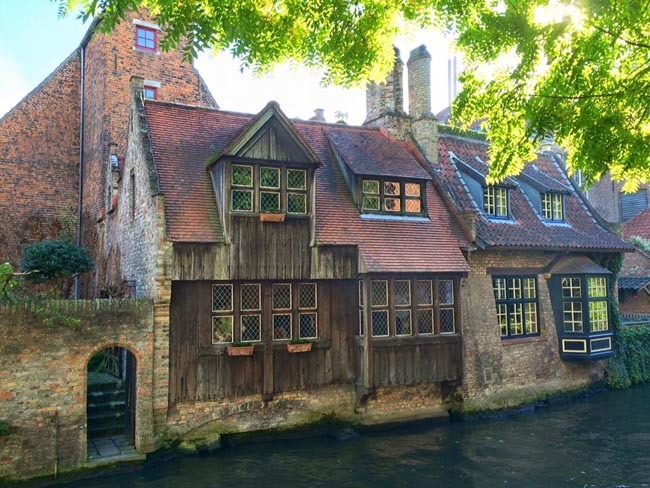 From the 13th to the 15th centuries Bruges was northern Europe's leading trade center, owing its prominence largely to thriving wool and textile industries. 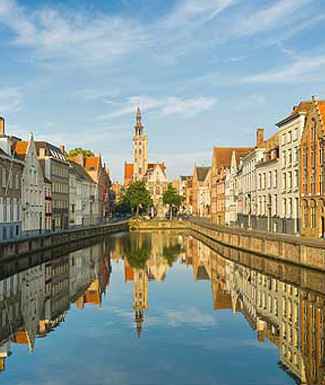 We will stroll the streets of Bruges and soak up the warm, friendly atmosphere of this lovely Belgian city. Throughout the town you will see signs of the mercantile history in the beautiful houses built by the wealthy textile merchants. Our walking tour will also take us to the Church of Our Lady and to Market Square, with its distinctive belfry tower. At the picturesque market square you will be able to climb to the top of the 13th century belfry for magnificent views over the city. We will also visit the Basilica of the Holy Blood, with its sacred relics. Later we will have a chance to see Bruges from another perspective -- from onboard a boat navigating the city's winding canals for half an hour. Those open-top canal-boats provide us with a uniquely satisfying view of the city. In the afternoon you can spend some time on your own strolling quietly along the town's tranquil canals and laneways. This morning we travel from Bruges to Antwerp by train. Located on the banks of the Schelde River, Antwerp is Belgium's major port and has been commercially important in European trade since the 11th century. In spite of damage suffered during both World Wars, Antwerp remains a city full of beautiful historic architecture dating to the 16th century. The origins of the name Antwerp come from "aan de werpe", which is Dutch for "at the throw", referring to where the river throws its sand. 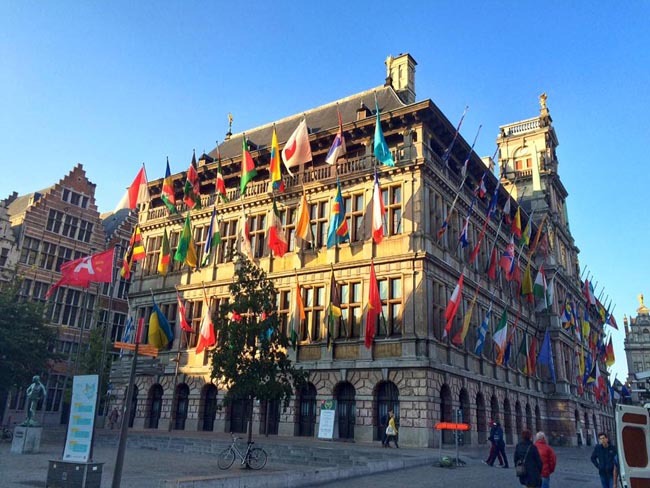 Modern Antwerp combines high fashion with a medieval Old Town, and today we will explore the well-preserved Old Town, built around the Grote Markt (Town Square), and graced by the lovely old Town Hall and guild houses. We will marvel at the elegant spires of the Cathedral of Our Lady, graced with masterpieces by the great painter Peter Paul Rubens who lived here in the 17th century. Amongst other treasures, the cathedral contains four of Rubens' master works: "The Elevation of the Cross", "The Descent from the Cross", "The Ascension of the Virgin" and "The Resurrection of the Virgin". We will also stroll along the Meir (Antwerp's main shopping street), lined with wonderfully elaborate historic buildings. We end our day with a drive out to Antwerp's famous harbour, the largest in Europe! Here we will enjoy the breathtaking panoramic views from the top of the MAS Museum. PLEASE NOTE that Antwerp is served by Brussels Airport, located roughly 45 minutes from Antwerp by car. 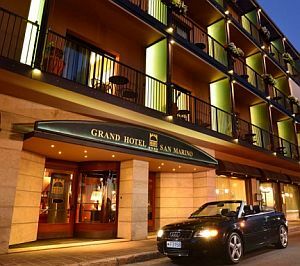 The part of the hotel that best represents the image of the Grand Hotel San Marino, synonymous with hospitality and ...	is the lobby, which reflects the modern and elegant style of the hotel. A comfortable and elegant space in which to relax in one of the comfortable arm chairs that offer a view of the enchanting Montefeltro valley below. Those who would like a coffee, an aperitif of a quick bite of lunch can go to the American Bar, the ideal meeting point and an elegant room surrounded by the bright colours that act as a frame for the entire structure. At the centre of the lobby is the front desk of the hotel, where our professional reception staff is always at your disposal to satisfy your every need. 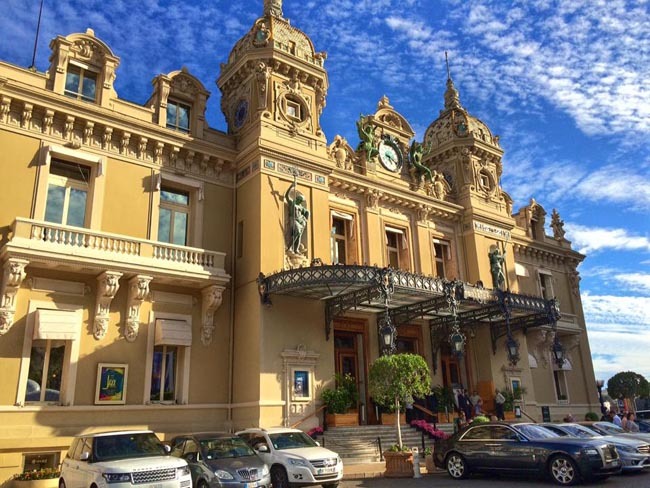 The Novotel Monte Carlo hotel is situated in the heart of the principality, just a short walk from the train ...	the Place du Casino and the Grimaldi Forum. It has 218 rooms (including 11 Junior Suites), some with stunning views over the Rock of Monaco and the sea. It also boasts a restaurant, a bar and 12 rooms for meetings and conferences. The Novotel Monte Carlo is ideal for business travel or weekends in Monaco as a couple or with family. Welcome to the Hotel Mercure Porte de la Cité Located just a few steps away from the Medieval Citadel, within ...	few minutes of the Canal du Midi and the Bastide of Carcassonne, this attractive building has a unique view of the ramparts of Carcassonne’s ancient fortress. Set inside a gorgeous garden of greenery, the hotel’s private outdoor pool allows guests a wonderful view of the towers of the Medieval Citadel. The hotel has a warm and cosy atmosphere in a perfect setting, whatever the season : at the bar with its fireplace to relax comfortably or in the restaurant La Vicomté, opening out into the hotel’s gardens, with all the flavours of the Mediterranean in its menu offerings. Whether on a tour, for business or for leisure, Hotel Mercure Porte de la Cité is an ideal place to stay in Carcassonne. 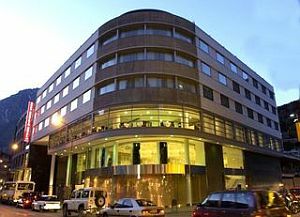 NH Hotel Group is one of the top 25 chains in the world and one of the main ones in ...	NH Hoteles operates almost 400 hotels with around 60,000 rooms in 28 countries across Europe, America and Africa. The Company is listed on the Stock Exchange of Madrid. 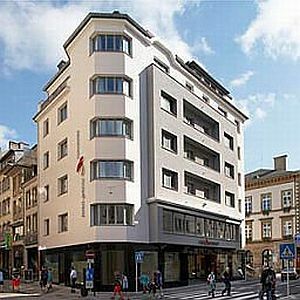 The four-star Residence Hotel was built in 2003. 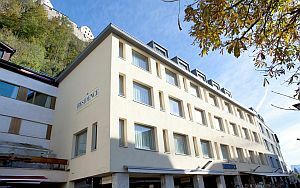 Enjoy the luxury of modern technology and professional business service for a ...	or long term stay in Liechtenstein. The hotel offers 29 guest rooms in four room categories. Our conference room "Oberland" is perfect for a small meeting or presentation. 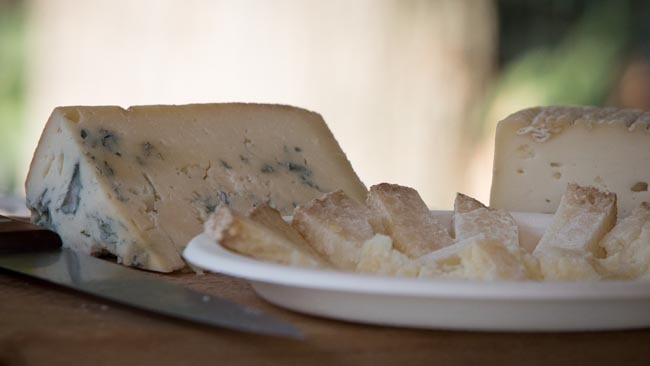 Guests may dine at Residence Restaurant or enjoy a drink at the Blue Lounge Bar in the same building. The souvenir shop provides local knick-knacks to bring back home. The hotel is located in the middle of town next to an underground parking lot where spaces can be reserved. ...	and tourist destinations abound in the area and most of Luxembourg's shops are found here. This lends great ease of access and conviviality to the establishment. Able and attentive staff awaits guests at the Simoncini hotel, where the fundamental concepts revolve around practicality, harmony and well-being. Fifty meters away, in the middle of the pedestrian zone, can be found the French Hotel of Luxembourg, in the loveliest square of the capital, with its restaurant and sidewalk café. Grand Hotel Casselbergh**** has 118 elegant rooms. 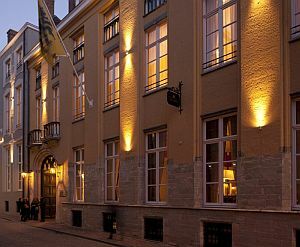 They combine modern luxury with the authentic charm of 18th-century Bruges. The hotel has various meeting rooms, 40 parking places, and a superbly appointed wellness centre in the 16th-century cellars. This romantic hotel is certain to enchant you and welcome you with its attentive hospitality. An elegant 17th century neo-roccoco mansion has been converted into a luxurious contemporary hotel with 29 rooms. Hotel `t Sandt ...	ideally located in the heart of the historic city centre just around the corner from most of the stylish design stores, funky restaurants and the trendy South quarter. 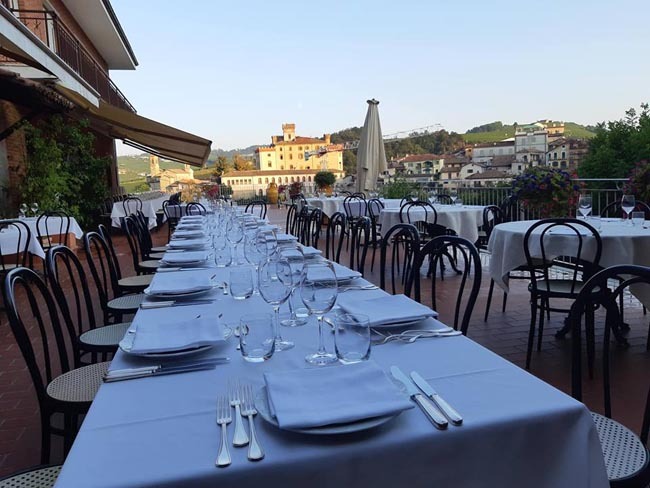 Our guests may always enjoy our beautiful Italian courtyard and our summer terrace wich offers an appealing view of the Cathedral. Weather permitting it is possible to have the breakfast outside. Our enthousiastic staff will make sure that thanks to their relaxed and professional approach your stay in Antwerp will be even more unforgettable than anticipated. Leave your car behind in our closed garage and discover on foot our fascinating city. Breakfast and dinner (mostly local restaurants) daily. All transport, accommodation, sightseeing and entrance fees for sites noted as 'visited' in the detailed itinerary. Gratuities for driver, restaurant staff, local guides, porters (if available). Airport transfers for land & air customers arriving / departing on tour dates. A mandatory single supplement may apply to this tour if you have selected our share program and we cannot find you a share partner. International airfare to/from the tour. Tour Leader gratuities, lunches, drinks, personal items (phone, laundry, etc), international air taxes (if applicable), any excursions referenced as 'optional'. Airport transfers for Land Only customers. Optional trip cancellation insurance. Our post-reservation trip notes offer further guidance on optional meal costs and shopping. This tour is offered in the late spring/early summer and the fall when temperatures are relatively mild and crowds thinner. This trip covers a large geographical area over which there can be a wide range of weather conditions. In the south (Mediterranean) region, one can expect warm-hot conditions, depending on elevation and proximity to the sea or mountains. To the north, temperatures will be considerably milder with a greater possibility of rain showers. Local land transport provided by private bus, 24-36 seats depending on ultimate group size (see 'group size') and train. This tour is not strenuous per se, but you MUST be able to manage with your own luggage at rail stations and from station to hotels nearby. This is a busy program with numerous city/town walking tours featuring uneven/cobbled surfaces, inclines and/or stairs. You must be able to spend several hours on your feet per day, walking at a leisurely pace. There may not be porters available in all locations. We may also make use of public transit in some cities in order to maximize sightseeing where vehicles are impractical (most people quite enjoy this insight into daily life). 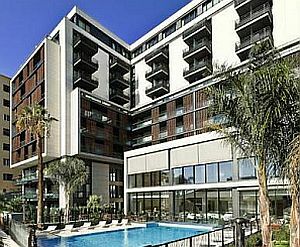 Mid-range (3* & 4*), well-located, air-conditioned, hotels and inns throughout. Some may be smaller properties (2-3 story) and may not have elevators. All hotels have en-suite toilet and bath, though some will have shower only (no tub). Porters may be available (see 'Inclusions'), though you must be MUST be independent with your luggage. Tour Leader throughout, local drivers, step-on site and city guides.